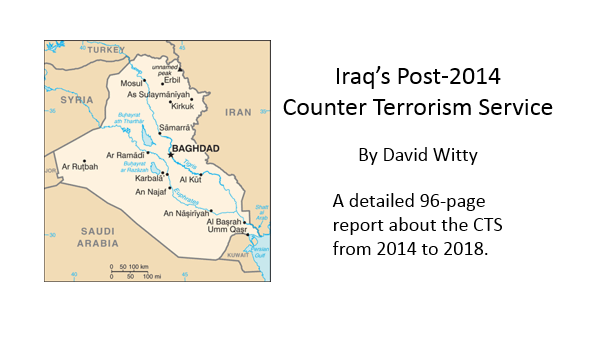 A recently published report (October 2018) details the history, organization, and missions of Iraq’s Counter Terrorism Service (CTS). David M. Witty, a retired Special Forces officer and constant observer of Iraq’s fight with the Islamic State (ISIS), provides us with a 96-page (pdf) paper on the CTS. The reports full title is Iraq’s Post-2014 Counter Terrorism Service. It is available on the website of The Washington Institute for Near East Policy. Despite the great success of the CTS over the past four years there is danger of its effectiveness and capability being diminished. While it performed extremely well as a conventional urban combat force in recent years, the author – David Witty, cautions that it needs to return to its core mission of counterterrorism. The concluding chapter provides some excellent recommendations. Special operations veterans will recognize themes associated with the ‘by, with, and through’ concept. These include consistent advisory efforts, permanent advisor teams that repeatedly conduct tours with the same host nation units year after year, and a well-entrenched training and education foundation to a SOF force. Witty comments on CTS force size, interservice coordination, and how the US experience with Iraq’s Counter Terrorism Service could be applied to other regional countries facing terrorism challenges. This is a comprehensive read on the CTS and will certainly add to the knowledge level of those interested in the SOF units of Iraq. The report’s author, David Witty, served as an SF and Foreign Area Officer. He has more than twelve years of experience working in the Middle East. He is an adjunct professor at Norwich University’s Online Security Studies Program. He tweets on a daily basis on the ongoing political, diplomatic, and military events in Iraq at @DavidMWitty1.